Still no chocolate or copious amounts of butter or sugar to be found in the Brown Eyed Baker kitchen. I’m not ashamed to admit that I’m still operating in non-sweets mode over here. 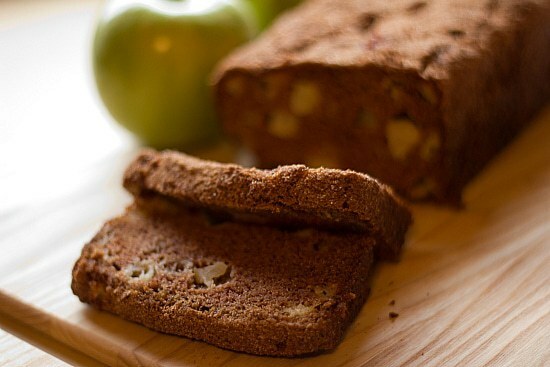 After the oatmeal muffins yesterday, I continued on with this ah-mazing quick bread recipe. Seriously amazing. As with just about all quick bread recipes, this one is, well, quick. Which is a welcome break after clocking some serious kitchen time over the holidays. 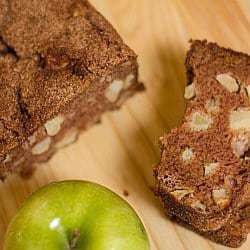 The bread is tremendously moist, has awesome apple flavor thanks to both the chopped apples and applesauce in the batter, and last but not least – the topping. This bread gets a serious dousing of a cinnamon/sugar combo on top to create a fabulous crust. 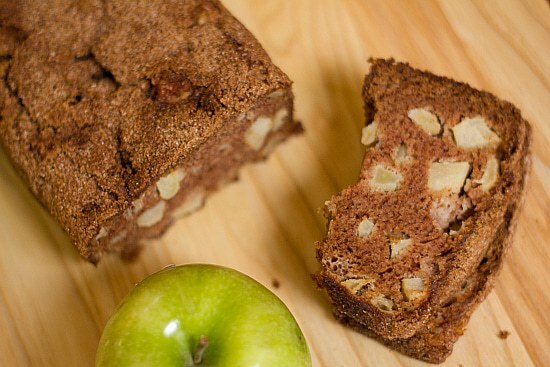 It all makes for, hands-down, one of the absolute best quick breads I have ever had. 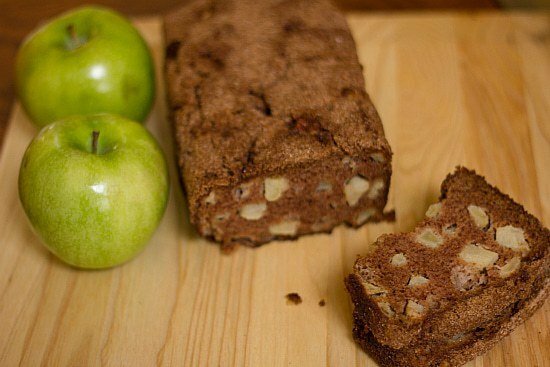 Granny Smith is the recommended apple for this recipe, but I think just about any would work. I’m always a big fan of using what you have on hand, so whatever your favorite apple variety is, go for it! I can personally attest to this bread being perfect for breakfast, a snack and dessert. I haven’t attempted it for lunch or dinner, but I’m certain it would more than qualify for those meals as well. Also, I’m very tempted to toast a piece of this and smear some peanut butter on it. Because I can’t help myself with the peanut butter. I just can’t. You know this. Forgive me. But I seriously think this bread + peanut butter could be an amazing invention. Tomorrow morning, it’s on. Preheat oven to 350 degrees F. Grease an 8x4-inch loaf pan, line the bottom with parchment paper, then grease the parchment paper; set the pan aside. In a medium bowl whisk together the flour, cinnamon, baking soda, salt, allspice and cloves. Set aside. In the bowl of a stand mixer, beat the eggs on medium speed for about 30 seconds. Add in the oil, applesauce and vanilla and mix until smooth. Next, add the sugar and mix until well-combined. With the mixer on low speed, gradually add in the flour mixture and mix until the flour is just barely combined. Gently fold in the apples with a rubber spatula. Pour the batter into the prepared loaf pan. In a small bowl mix together the brown sugar, granulated sugar and cinnamon. Sprinkle evenly over the batter in the loaf pan. Bake for 50 to 55 minutes, or until the loaf is golden and a thin knife inserted in the center comes out clean. Cool the bread in the pan for 10 minutes, then run a dull knife around the sides of the loaf and turn it out on a cooling rack, remove the parchment paper and place right-side up. Cool completely before slicing. Wrap leftover loaf in plastic wrap and store at room temperature.